Some German historical documents also refer to "cruces". The exemplar shown here probably dates from the 15th to 17th century from Germany. 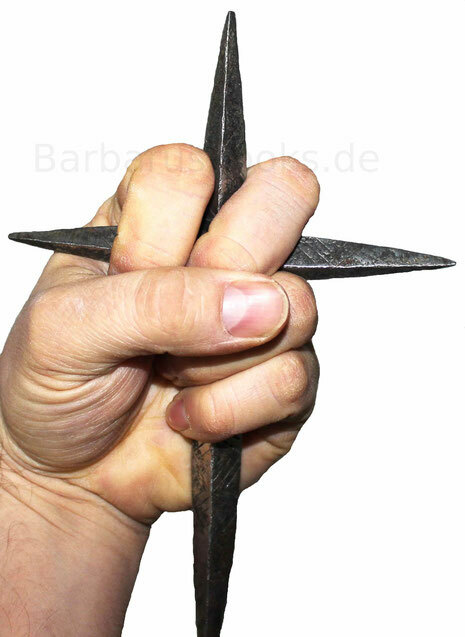 Throwing crosses were common weapons of peasants or citizen in parts of German-speaking countries at that time, so that they were subject to some prohibitions. Due to excessive alcoholism and everyday quarrelling’s, in some cities no weapons were allowed to be carried, not even hidden under skirts and pants. In 1568 the wearing of "rifles, swords, daggers, flails, hammers, lead or iron balls, throwing crosses, etc." was prohibited in Iglau in Moravia. 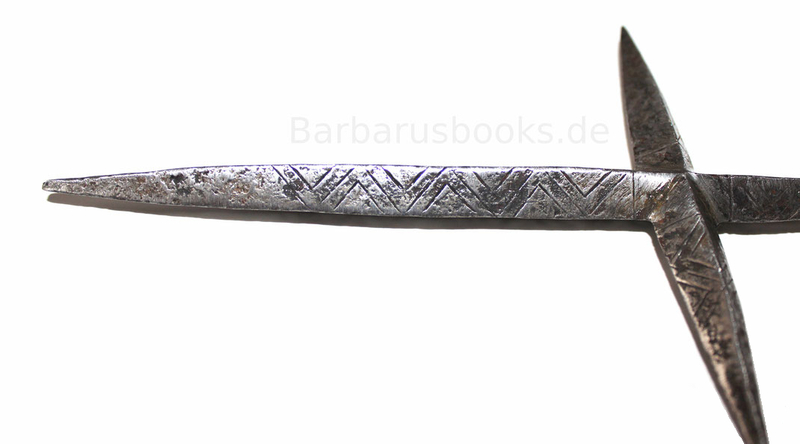 Detailed view of the lower longitudinal axis of the throwing cross with ornamentation in serrated lines - typical for throwing crosses. 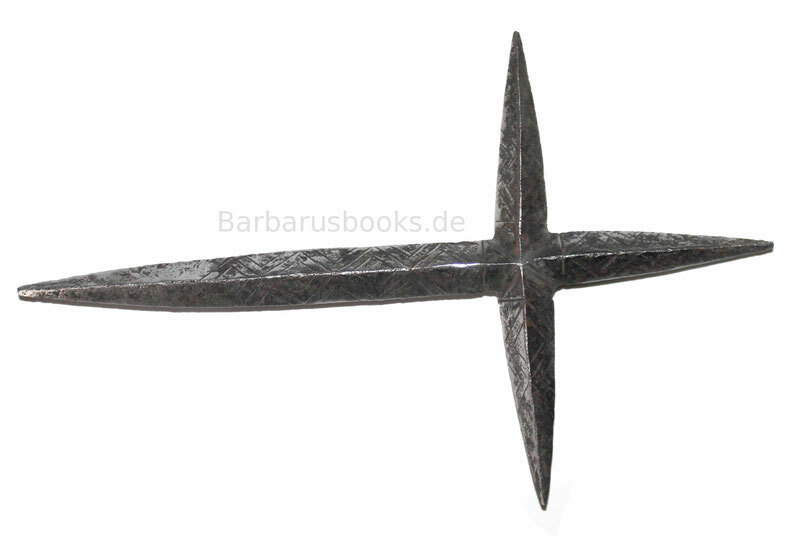 On each side of the axis these ornaments can be seen in serrated lines. However, the throwing cross was not only used as a throwing weapon, but also as a hitting weapon. Thus, by holding the cross in the middle with one hand, the perpetrator tried to smash the victim's head or pierce the neck with the tip of the cross. 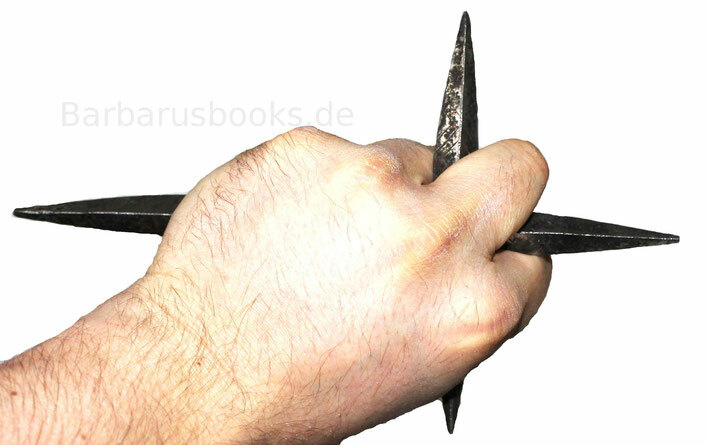 In books, however, the throwing cross is clearly referred to as a throwing weapon. The throwing cross is similar in function to the "English arrow", the short throwing spear, and the throwing axe. It should hit the enemy and inflict deep, heavy bleeding wounds. Bone and skull fractures can also be caused.